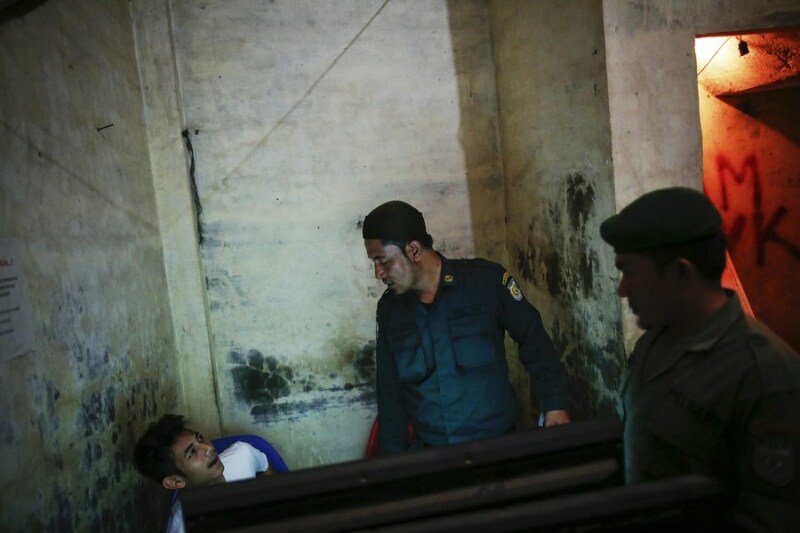 Shariah policemen speak to a student who was caught playing games in an Internet cafe during school hours in Banda Aceh, in Indonesia's Aceh province. The boy was given a morality lecture and forced onto a shariah patrol truck to be taken back to school, where he faced humiliation from other students and teachers. Female members of the Wilayatul Hisbah shariah police get instructions from a commander before going on patrol in Banda Aceh. 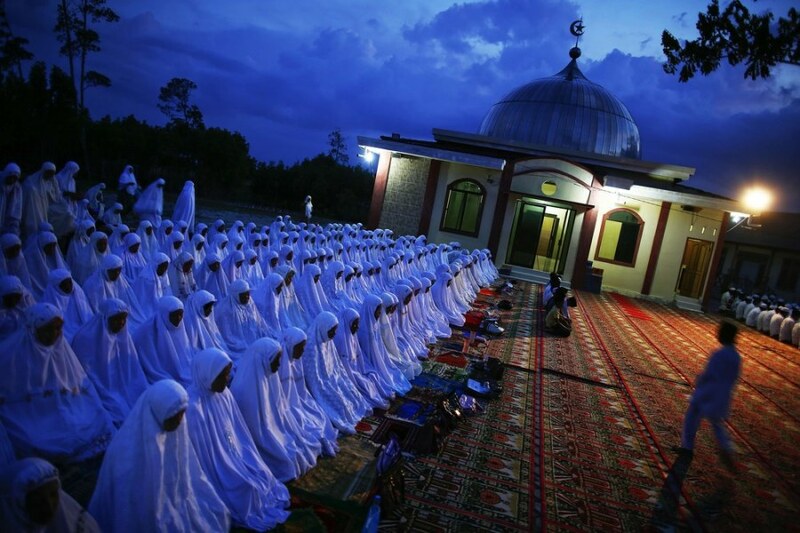 Photos and text by Damir Sagolj, Reuters — Indonesia is the world's most populous Muslim nation, but nowhere is the faith more strictly interpreted than in Aceh, sometimes referred to as the "verandah of Mecca" because it was one of the first parts of the archipelago to turn to Islam. 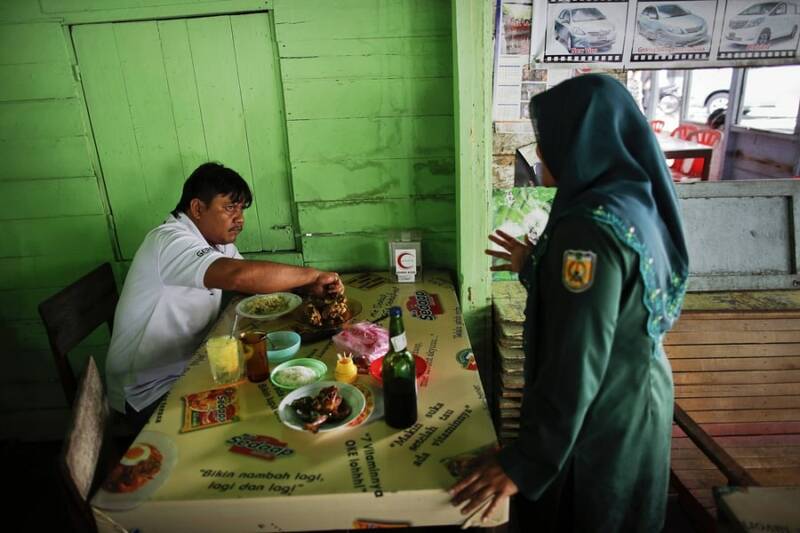 Aceh, which was hit by a tsunami in 2004 that killed an estimated 130,000 in the province, is Indonesia's only district to have implemented shariah, or Islamic law. This is something that occurred for complicated reasons, some of which go well beyond the religion itself and have more to do with Acehnese tradition, the long struggle for independence and conflict with outside forces, Jakarta included. Formed to implement shariah law, Wilayatul Hisbah, which is the official name for the shariah police, is spread across the province working in small units, patrolling and conducting occasional raids. The units are made up of different kinds of people – some of them claim to be on a mission, others just needed a job. The set of laws in force in Aceh is just a smaller part of what would be full shariah implementation, covering all levels of society. At present, the shariah package in Aceh targets only those violating the Muslim dress code, illicit behavior, drinking and gambling. Dating can be particularly hazardous — under shariah, it is a crime for an unmarried man and woman who are not related by blood to associate in an "isolated place." As a consequence, it has become increasingly popular for young couples to get to know each other using social networks like Facebook. Read more at Reuters' Photographers Blog. 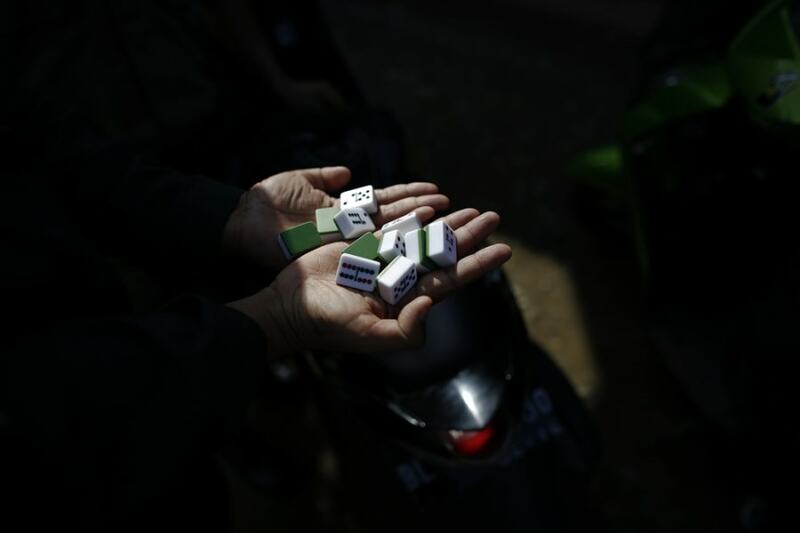 A shariah policeman shows dominoes found in the bag of a boy who ran away after a patrol spotted him and a friend during school hours in Banda Aceh. The dominoes were thrown in the mud and police continued their patrol after unsuccessfully chasing the boys. 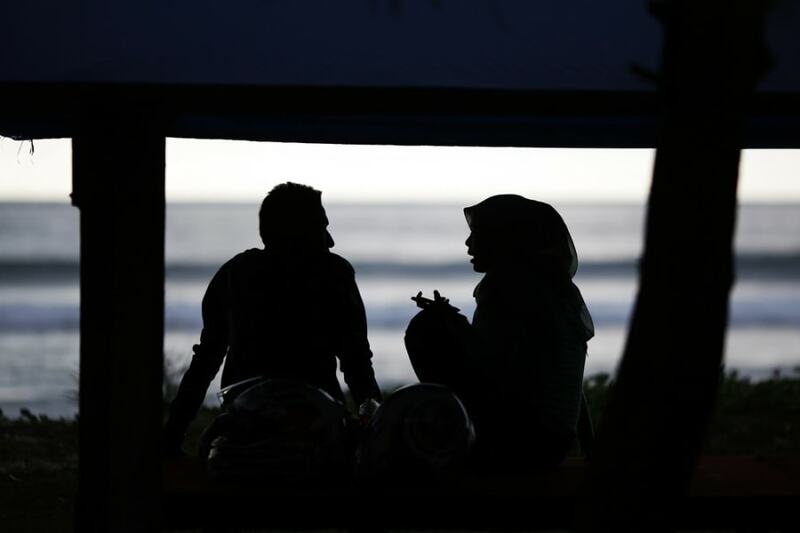 A young couple chat in the shade on a beach near Banda Aceh. Under shariah, it is a crime for an unmarried man and woman who are not related by blood to associate in an "isolated place." Members of the Wilayatul Hisbah speak to a young couple after they were caught sitting too close to each other in an isolated place in Banda Aceh. Winda Wahyuni kisses the hand of her husband, Ahmad Yasir Saputra, after they got married in a mosque in Banda Aceh. Winda and Ahmad Yasir, who met a year ago on Facebook, married in a religious ceremony in a local mosque. Dating on social networks has become increasingly popular in Aceh due to the restrictions that shariah places on unmarried men and women. Winda Wahyuni, center, and husband Ahmad Yasir Saputra, left, pray during their wedding ceremony in a mosque in Banda Aceh. 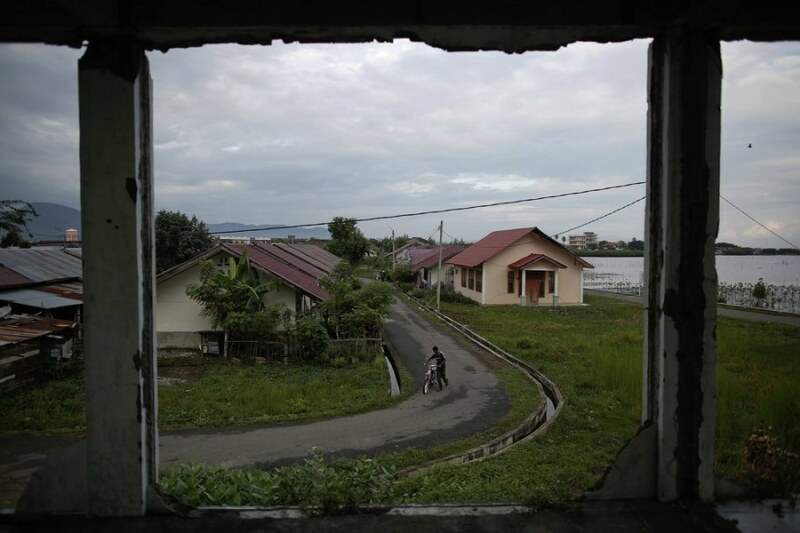 A man is seen from inside a house in Banda Aceh that was destroyed in the 2004 tsunami. 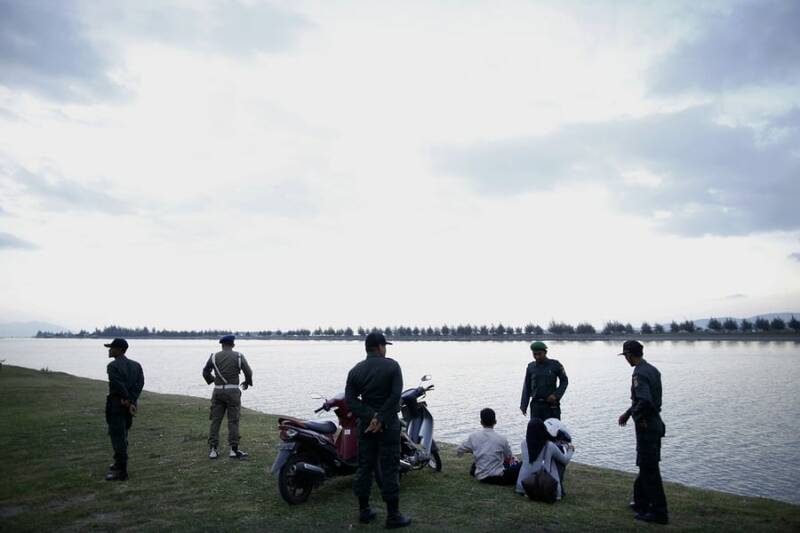 Some residents near the sea believe the tsunami that killed an estimated 130,000 people in Aceh province was a punishment from God for those who broke Islamic laws, and they fear it might happen again. 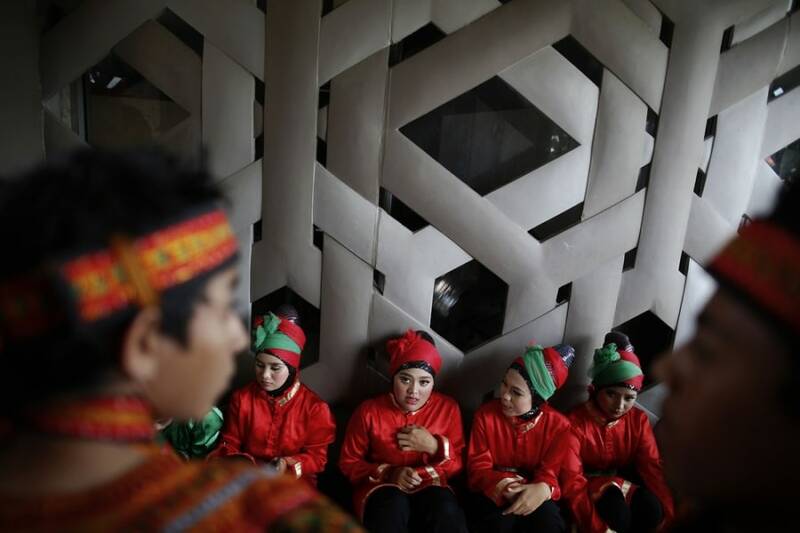 Boys and girls meet at a cultural event in Banda Aceh. Muslim worshippers gather for an evening collective prayer outside a mosque in Banda Aceh. 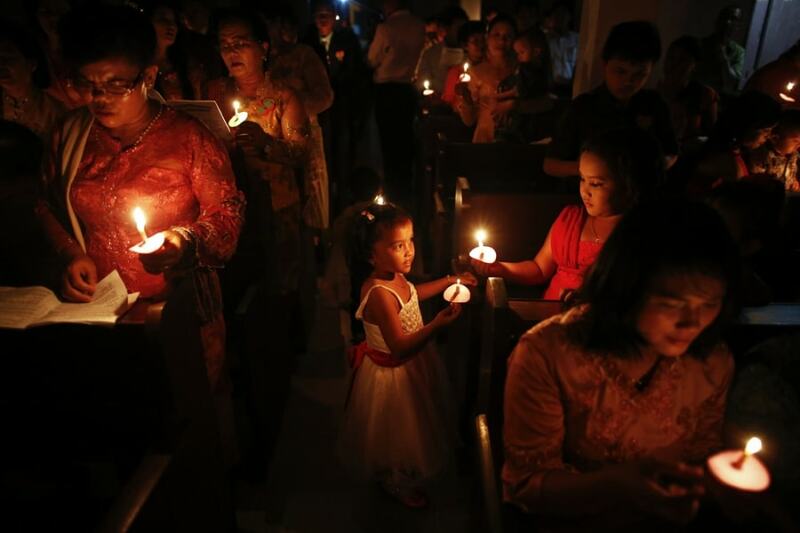 Acehnese Protestants attend an early Christmas mass in their church in Banda Aceh. Although it is complicated to build a new Christian church in the predominantly Muslim province, Father Amrin Sihotang of HKBP Protestant church said his community has no problems with strict Islamic laws as long "as we follow the rules." Young people relax at Ulhee Ilhue beach in Banda Aceh. The gates of the beach close every day at 6 p.m. to prevent people violating Islamic law. Asked about shariah police who often patrol the beach looking for violators, one of the youngsters said, "I don't like them. They simply disturb me." 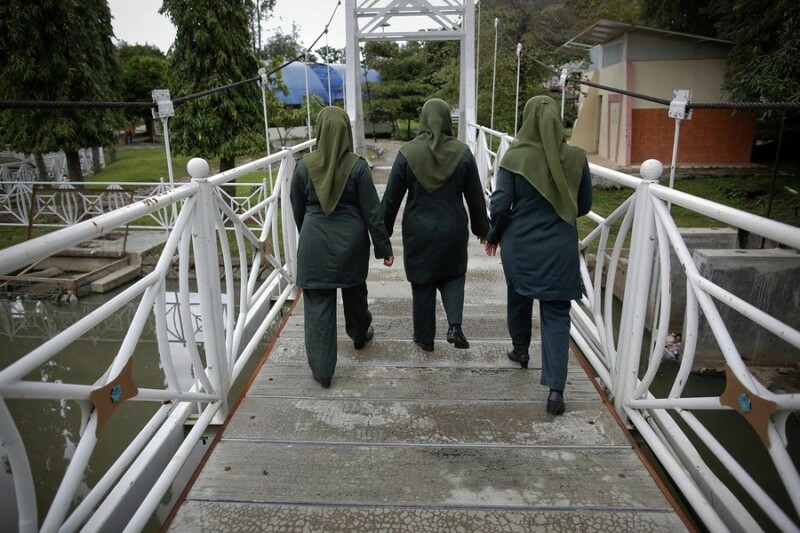 Female members of the Wilayatul Hisbah enter a public park as they search for those violating shariah law during their patrol in Banda Aceh. A female member of the Wilayatul Hisbah insists on inspecting the clothes of girls relaxing in a park in Banda Aceh. Members of a punk band named Trotoar Chaos are shown in Banda Aceh. Although they say they have been punished and had their hair shaved in the past by police, the young musicians remain defiant and insist they will stay in Aceh. One of them commented on a 2011 incident in which he was punished after being caught among 65 other punks at a concert: "There is a big change after that. Now I want to fight more." A member of the Wilayatul Hisbah tells a man he should stop eating his lunch and go to the mosque just before Friday prayers in Banda Aceh. Besides patrolling with their male colleagues every day looking for those who violate shariah, female police officers drive through the town just before Friday prayers urging businesses to close and demanding that men go to pray. 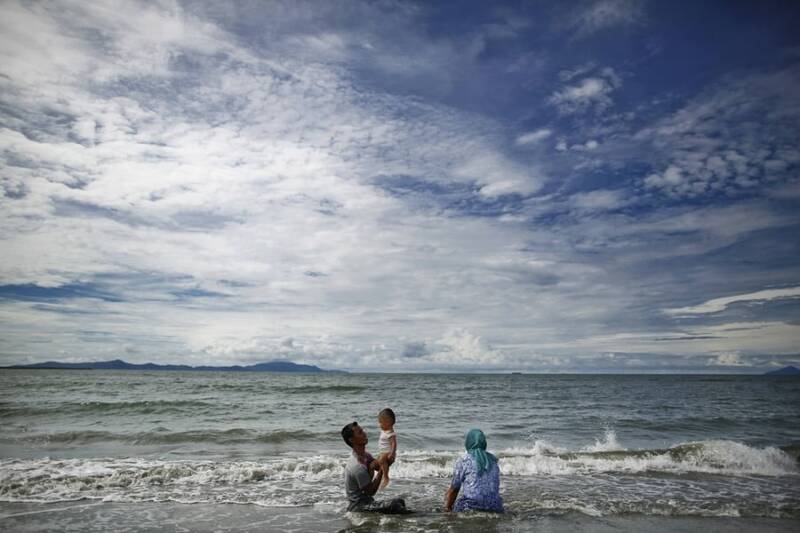 A Muslim family enjoys nice weather on a beach in Banda Aceh. EDITOR'S NOTE: Images taken between Dec. 6 and Dec. 11, 2012, and made available to NBC News today.